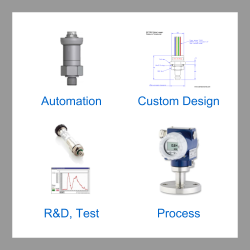 Select suction pressure transducers with a voltage output for measuring suction range pressures. These transducer have ranges from a few millibars to 1 bar (15 psi) to cover any full scale range from ambient zero pressure to max suction pressure. Use these transducers to generate an output signal from 0 to 5/10Vdc which varies linearly with applied suction pressure. Send us your enquiry for Suction Pressure Transducers to get assistance with this product type.